Bounce: 0 to 90 Degrees. You have options with the way in which you send light to your subject; use the bare bulb alone, attach its reflector, or slip the included diffuser over the reflector. Zoom Range: 18, 24, 28, 35, 50, 70, 85, 105, 135, 180mm. Although not designed for TTL compatibility, this flashgun provides an amazing list of technological advances found in professional flash units. The flash head includes seven user-selected variable zoom positions. Adding to the versatility of this macro flash unit are four light softening diffuser - translucent, yellow, white and blue. In addition, with mounting adapters are included. It features 48 LEDs which can light your subject with super bright light.or select 24 of them to provide light on the left.or chose 24 of them to illuminate your scene from the right. So no matter if you're shooting full auto or full manual every shot will be "picture perfect". Speaking of perfect, you'll find our Studio Series line has models and features for every need and budget--from compact models with small footprints yet big features, to our top of the line bounce/swivel model which automatically syncs with your SLR's zoom lens. 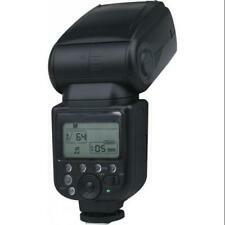 This is a Polaroid Macro LED Ring Flash Model PLMRFU It is essentially New Open Box. 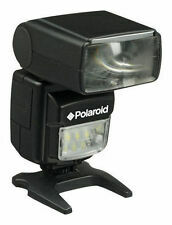 The Polaroid PL108 shoe mount flash is a Fully Automatic, TTL digital flash with a Guide Number of 60-feet @ 35mm. TTL Dedication Yes. Type Shoe Mount Flash With Tilt Head. Zoom Head No. Auto Focus Assist Lamp. A 2.5 mm sync port on the side further enhances your lighting capabilities by allowing you to connect an external flash unit while hot pink and chartreuse filters are included for artistic effects. Film & Darkroom. 27 Polaroid 268 Flashes - no mounting brackets- Art Project? Light Installation? Here is a lot of 27 Polaroid 268 flash units. They are in very good to excellent condition. 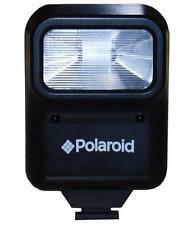 The Polaroid PL108 shoe mount flash is a Fully Automatic, TTL digital flash with a Guide Number of 60-feet at 35mm. This unit has a bounce flash head, red-eye reduction capabilities and a focus beam to assist in low light shooting conditions. New in sealed box. Fits Canon. This item is used, has been cleaned and is in working condition. I WILL REFURBISH YOUR FLASH, INSTALL NEW NICAD BATTERIES, CHECK OUT THE FLASH CAPACITOR FOR LEAKS, TEST IT, CLEAN IT. ABUSE, TAMPERING WITH THE FLASH OR LIQUID SPILLS ONTO THE FLASH UNIT WILL VOID THE WARRANTY. , Instant 1000, Instant 1000 DeLuxe, Model 500, Model 1000, Model 1000 S, Model 1500, Model 2000, Model 3000, OneStep, OneStep Plus, Pronto! RF, Pronto! S, Pronto! SM, Pronto! Sonar OneStep, Pronto! 50 sealed will throw in extra for free. Mu st h av e 10 positive fe ed ba ck s to b uy. F re e sh ip pi ng. Flash director is for pictures under 2 feet only. CONDITION: The body of this flash director is in terrific shape. Flash itself has not been tested and is being sold as-is. Most problems can be solved with a little communication. It features a red-eye reduction mode and a compact, lightweight design that makes it easy to place to best illuminate your photographic subjects. This is an incredible deal! It would make a great gift for a loved one or for yourself. If there are any flaws we try to point those out. 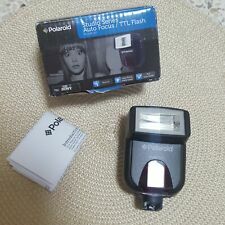 With The Polaroid Dua Flash You Have Both In 1! Flash has vertical bounce of 90 and horizontal swivel of 270, with automatic or manual zoom settings of 24mm, 28mm, 35mm, 50mm, and 85mm. Bounce, Zoom & Swivel Head. Polaroid PL144AZ-C Adjustable flash. shoe mount flash. SHIPS FREE !! Polaroid PL144AZ-C Adjustable flash. shoe mount flash. SHIPS FREE !!. Condition is used. Fits Canon Rebel. The flash stand is not included. This Polaroid Studio Series flash is in near mint condition. Fully tested and working perfectly. Compatible with Nikon i-TTL. AF Assist Light. 2x Lot of GE Flash Bar II Polaroid SX-70 Twin Packs, Plus 1 extra used flash bar, 23 Flashes total, NEW OLD STOCK. Condition is New. One bar is partially used. Shipped with USPS Priority Mail. TTL Dedication Yes. Flash has vertical bounce of 90° and horizontal swivel of 270°, with automatic or manual zoom settings of 24mm, 28mm, 35mm, 50mm, and 85mm. Bounce, Zoom & Swivel Head. It features a powerful Guide Number of 148'/45 m at 85mm position, and features a power-zoom flash head that covers a focal range from 24mm to 85mm. A ring light is the best source for close up photography. And that makes the Polaroid macro LED ring flash the perfect choice for amateurs and advanced photographers alike who require shadow free illumination ?. Film or digital. If you need an adapter with another thread you can use any step-down ring. CANADA ARE "THE REST OF THE WORLD". 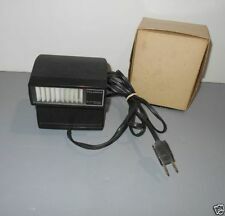 Two Polaroid Wink Lights, great condition, includes original boxes and manuals. 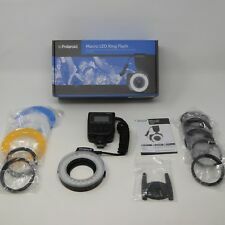 This Polaroid macro kit is new, unused and complete in its original box which has been opened. 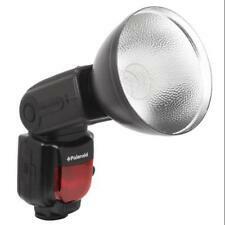 ThePolaroid PL108 shoe mount flash is a Fully Automatic, TTL digital flash with a Guide Number of 60-feet @ 35mm. This unit has a bounce flash head, red-eye reduction capabilities and a focus beam to assist in low light shooting conditions. This comes in the original packaging and shows no signs of wear or use. It has been tested and works. 2 polaroid print coaters, 7 flash bulbs, a leather strap, and flash diffuser. So no matter if youre shooting full auto or full manual every shot will be picture perfect. A year later, SkyMall had arrived! Our first ever catalog was published and distributed to passengers on Eastern Airlines flights, and a cultural institution (that’s us! ). There is a Alfon XL400 with original carry case. There is also an Olympus trip junior. All are untested and are being sold as is.